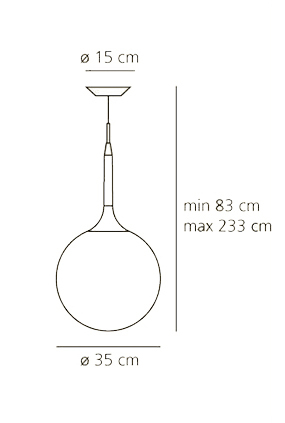 ARTEMIDE CASTORE 35 SUSPENSION is a lamp.The spherical diffuser design is enhanced by a removable-fitting and tapering luminous stem, that makes a sweet transition from the strong diffuser light to the blind lamp structure area. Ceiling rose and stem in thermoplastic resin, blown glass diffuser. Bulb not included, 1x150W Halo o 1x21W LED DIM (E27). Dimmerabile.